Dave Fernholz (right) at his Winning futures mentee Jama Whitaker’s (left) graduation. Dave Fernholz wanted to be better prepared for when his own kids became teenagers. 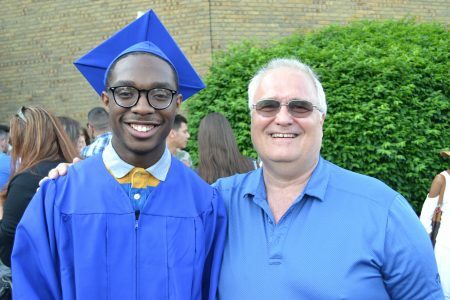 Little did he know that his desire to be a better parent would lead to two decades of mentoring and receiving our 20 Year Mentor Award and Sam Cupp Legacy Award. At last year’s Awards Ceremony, Dave was recognized for his dedication to mentoring and helping students succeed. Back in 1998, Dave noticed a mentor recruitment poster at work that was hung by Mike Fitzpatrick, owner of Fitzpatrick Manufacturing. Mike was mentoring in our program at the time and hoping to recruit new mentors. Dave was one of the first to sign up. His daughters have grown up and moved on to their own careers, one of them works with Dave and Mike at Fitzpatrick Manufacturing. Dave is the Plant Manager and just reached his 40th work anniversary. He and his wife Barbara recently celebrated their 30th wedding anniversary. Now he has reached one more amazing milestone: 20 years as a Winning Futures mentor. We are actively recruiting mentors for the 2019-20 academic year. Learn more and apply by July 30, 2019.